Lavender and shortbread are both splendid on their own. Combined they are truly remarkable. Join local chef, Anna Maria de Freitas as she makes a batch of Lavender Shortbread at the Farm using the Organic Culinary Lavender that we grow and harvest from our own fields on San Juan Island. 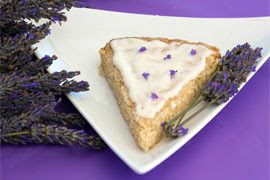 To make your own Lavender Shortbread at home you'll need Organic Culinary Lavender. Grown exclusively in our organically certified fields, our Organic Culinary Lavender comes from the first of the flowers to be harvested each summer. Lavender essential oil, although it’s fragrance is wonderful, can be paradoxically bitter to the taste when used in excess. When used in small amounts, it lends a delightfully delicate yet distinctive flavor to a wide variety of food and beverages. Too much and the bitterness can drown everything else out. For those desiring more instant gratification, our Lavender Shortbread is always available on our website. Paired with one of our Lavender Tea Blends they make a wonderful gift for yourself or someone else.